Thecus® is proud to announce the release of the latest incarnations of its ground-breaking line of home- and SMB-targeted NAS solutions. The 2-bayN2560 and 4-bay N4560 feature the latest Intel Atom SoCs, increased RAM, as well as all the hardware that made the original models such a success. Thecus® has also striven to improve functionality and productivity through the inclusion of the T-OnTheGo™ remote accessibility feature and the unveiling of the NAS Application Center online. With improved power and performance along with cutting-edge features, the N2560 and N4560 are pushing the boundaries in home and SMB networking. 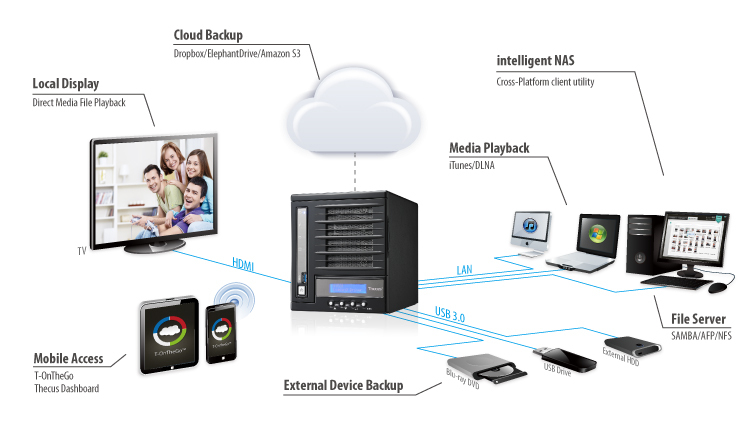 We’re a mobile society, and our NAS solutions are keeping up! Incorporated into the N2560 a nd N4560 is support for Thecus’s® T-OnTheGo™ smartphone app. Now supporting both iOS and Android, this NAS management software enables users to access, copy, stream, and edit any data between their NAS and mobile device. Your own personal cloud, from anywhere with internet access.